After a month of feverish speculation and shrewd wheeling and dealing, the 2013 January transfer window has been firmly shut. A total of about £120m was spent - double the outlay during the same period in 2012 and the fourth biggest total since the window was introduced in 2003. Below we look at the key statistics, provided by financial analysts Deloitte, of yet another eventful transfer window. Who were the big spenders? Manchester United manager Sir Alex Ferguson was content with his one purchase, Wilfried Zaha from Crystal Palace for £15m. Arsenal's Arsene Wenger was not too sure until he bagged left-back Nacho Monreal (£10m) from Malaga with a few hours of the window remaining. Chelsea did their business earlier in the window with the signing of Demba Ba, while champions Manchester City were at the centre of the biggest Premier League deal - although this time they were the selling club, with Mario Balotelli joining AC Milan for £19m. The biggest spenders were, in fact, Liverpool, QPR and Newcastle, with those three contributing to 50% of the January total. Newcastle and QPR, who were also among the top three in 2012, brought in six players each for a combined total of about £40m. Deloitte's Dan Jones: "There were relatively few active spenders in the winter window, with over half of this January's total transfer spending coming from three clubs. Winter window activity tends to be driven by the on-pitch competition at the upper and lower ends of the Premier League table. How did this January compare to previous years? After a quiet 2012 when Premier League clubs spent just £60m, they dug deeper into their pockets this January with a final total spend of about £120m. That is still well short of the blockbusting £225m outlay of 2011. Remember Fernando Torres to Chelsea for £50m and Andy Carroll to Liverpool for £35m? However, the actual net spend this January - after fees for players heading out have been deducted - was £70m, only £20m less than the net spend in 2011. More than £1bn has now been spent by Premier League clubs in January since the window was introduced 10 years ago, with more than £3.7bn spent during the summer windows. The start of the January window began at the same time as the arrival of billionaire Chelsea owner Roman Abramovich - as a consequence, the Blues currently top the list of big spenders in the winter month, having forked out £135m for players. 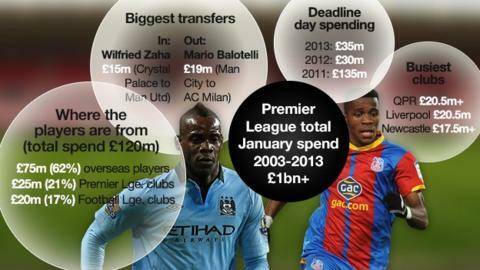 Manchester City are second in the table, with a spend of £109m. Deloitte's Dan Jones: "Premier League clubs have been relatively restrained in their player transfer fee spending [this January], in spite of the upcoming uplift in their broadcasting revenues of between £20m and £30m each from next season. "Clubs are now in a reporting period that will count towards the first assessment of Uefa's financial fair play break-even requirement for international competition and Premier League clubs are also considering the implementation of additional cost control regulation at a domestic level. "Their apparent relative restraint in this transfer window may reflect an increasing focus on clubs achieving more sustainable levels of expenditure relative to revenues." Where did the players come from this January? Most came from overseas, which is probably little surprise to many. In total, £75m (62%) was spent on players from outside the United Kingdom during this window, with £25m on players from within the Premier League and £20m on clubs in the Football League. Newcastle brought in five players from Ligue 1, with French clubs receiving a total of £170m from Premier League clubs in transfer fees during the period from 2010 to 2013. "There is slightly more value in the French market," said Magpies manager Alan Pardew. "Obviously, we have exploited that. "Zaha is a typical example of trying to take a young player out of the Championship. I like him. I wanted to take him but, seriously, we had no chance. We just can't pay that." Spain has earned the most from England's top league with a whopping £200m spent on players from the country during the last three years, although in this window the transfer of Malaga's Nacho Monreal to Arsenal for £10m was the only arrival from La Liga. About £110m has been spent on Italian players, with £100m going to Germany and £80m heading to Portugal. The biggest deals of this transfer window involved two Brazilians and two clubs owned by billionaire owners outside the top four European leagues. Paris St-Germain signed attacking midfielder Lucas Moura from Sao Paulo for £38m, which was actually trumped by their announcement they had lured football icon David Beckham to the French capital on a five-month deal. Meanwhile, Russian side Anzhi Makhachkala, managed by Dutch coach Guus Hiddink, are reported to be close to securing a £30m deal with Shakhtar Donetsk for their midfielder Willian. Is this a sign of things to come as the Russian league grows from strength to strength? Spanish football writer Andy West: "It's been a quiet window in Spain, reflecting the deep financial problems that are affecting the majority of clubs - and the country in general. "The biggest move was Real Madrid's recruitment of goalkeeper Diego Lopez from Sevilla, but that was forced upon them by the broken hand suffered by captain Iker Casillas. "La Liga fans can be very pleased to have avoided the departure of more star names. Players like Radamel Falcao, Isco, Kaka, Alvaro Negredo and David Villa were all heavily linked with moves overseas, but they're all still in Spain and that's good news for the league. "The only really notable departures were Malaga's left back Monreal to Arsenal and Fernando Llorente, who will join Juventus from Athletic Bilbao in the summer." French football writer Matt Spiro: "Top talents Younes Belhanda, Etienne Capoue, Bafetimbi Gomis and Lisandro Lopez all stayed, and one French international Alou Diarra has returned, joining Rennes on loan from West Ham. "After seeing the likes of Yann M'Vila, Moussa Sissoko, Mapou Yanga-Mbiwa, Loic Remy and Mathieu Debuchy all leave earlier this month, deadline day's better news - combined with David Beckham's arrival at PSG - has provided the French League with a much-needed fillip." European football writer Andy Brassell: "The real January fireworks went off earlier in the month, with Galatasaray's double signing of Wesley Sneijder and Didier Drogba. Bagging such a top-class pair - who are both available to play in the last 16 of the Champions League - at a relatively modest initial outlay is not to be sniffed at, and will only strengthen the branding of Turkey's SuperLig. "The real money has come from the east, with Anzhi's soon-to-be-completed £30m swoop for Shakhtar Donetsk's Willian making us wonder whether the English Premier League is to be usurped as the most lucrative destination for players."